“How many times have we had this conversation?” I looked at my teenager in disbelief that once again we were having the same conversation about homework and chores that we had maybe a week ago. In between my frustration and a certain level of anger, I felt like a complete failure as a parent . I was officially a nag with a capital N! I hate being the nag. My kiddos hate the nag. And when I nag, I get grumpy. And when I get grumpy, it makes my hubby grumpy. And no one likes being grumpy. But I also knew that I had cursed myself. I lacked follow-through and discipline. In my effort to help my kids be successful, I had created a sense of entitlement and “mom will bail me out” mentalities. It was time for a change if I wanted things to get better. And it needed to happen STAT! So I sat down and developed a list of all of the things I nag about. Everything from socks to homework was fair game. Toilet seats left up, toothpaste left in the sink, and the inevitable chore chart. I could literally feel the rock in my stomach as I thought of all of the things that had gone wrong that day. When I was done, I looked at my list and literally cried. I wasn’t overwhelmed by what was on the list, but by how it made my children feel. 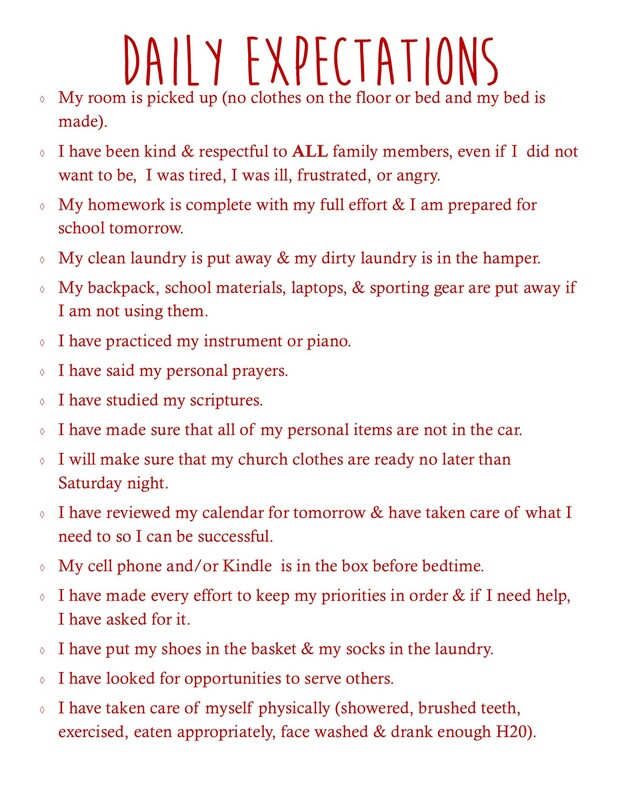 Had I sunk so far that all my kids thought I cared about was the things on this list? Did a clean house mean more than spending time with them? Did having their homework done make me happy? It wasn’t the truth, but it certainly was perception. And it hurt. It hurt me. It hurt them. Our family was more important than the nag list I created. There would be years of clean and organized houses ahead of me, but I would only have this one chance to have these kiddos in my home at this age. My room is picked up (no clothes on the floor or bed and my bed is made). I have been kind & respectful to ALL family members, even if I did not want to be, I was tired, ill, frustrated, or angry. My homework is complete with my full effort & I am prepared for school tomorrow. My clean laundry is put away and my dirty laundry is in the hamper. My backpack, school materials, laptops, and sporting gear are put away if I am not using them. I have practiced my instrument or piano. I have said my personal prayers. I have studied my scriptures. I have made sure that all of my personal items are in the car. I will make sure that my church clothes are ready no later than Saturday night. I have received my calendar for tomorrow and have taken care of what I need to so I can be successful. My cell phone and/or Kindle is in the box before bedtime. I have made every effort to keep my priorities in order and if I need help, I have asked for it. I have put my shoes in the basket and my socks in the laundry. I have looked for opportunities to serve others. I have taken care of myself physical (showered, brushed teeth, exercised, eaten appropriately, faced washed, and drank enough water). After we had our family counsel and explained the new boundaries, I knew it would require consistency and reminders of what was expected. It is now hanging in each bedroom, bathroom, and on the fridge in the kitchen. You can print your own copy by visitng our downloads page or clicking here. What you don’t see on this list is a timeline of when I expect it to be done. I realized that part of empowering my children was also letting them learn the hard way when things don’t get taken care of. For example, expecting me to do their laundry for school/work/game the next day when they put it in the laundry at 11pm the night before doesn’t work. The naggy mom would have been angry and grumpy the whole time I’m staying up to bail them out of the pickle they created for themselves while they slept snuggly in their beds. That can’t be the norm (especially with 14 of us at home). Now, I can point to expectations 11 and 13 and ask them how they are going to work through the situation. They have asked me for help (which I am delighted to do…silly, prickly teenagers) and then together we solve it. If there is a reason I need something done ahead of time (like making a bed or picking up after school because company is coming), I let them know ahead of time what to expect rather then being grumpy that they didn’t do it (without knowing or reading my mind). It is a huge relief. My kids are happier. I AM HAPPIER! My hubby is happier. We have beat the curse of the nags for now and I’m looking forward to a happy, nag-free 2015. Next Post That’s Too Many Kids!